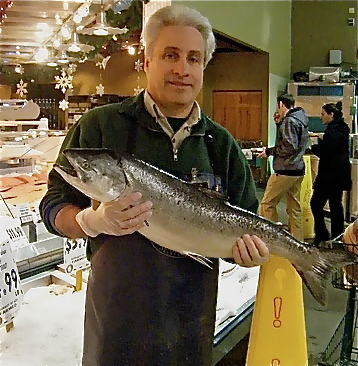 Last week, when I wrote about salmon from a restaurant-centric point of view, I heard from not a few of you regarding your favorite place to eat wild Northwest salmon. Overriding verdict? At home. And who am I to disagree? So, today on KPLU’s “Food for Thought” Stein and I had a nice yak session about my favorite finfish, where I gave you, my Eaters, the nod for your DIY-attitude and shared my husband’s time-tested recipe for keeping salmon moist on the grill (check it out, here) . Mac’s been grilling salmon using his quick-to-prep chutney-based recipe for 30 years. And despite the multi-flavored ingredients (including Major Grey’s, barbecue sauce and lemon juice), his paste magically manages to complement — not overwhelm — the fish. Anyway, since it’s salmon season, I thought I’d throw this question out there: Have you got any simple grilled-salmon recipes you’d like to share? Catch me if you can! If not, go see your local fishmonger. That’s what I always do. What do you mean you don’t have one? I know some folks who can help you out: my seafood-lovin’ Eaters, who shared their thoughts on the subject in the comments on this post.